SIU Edwardsville (8-15, 4-7) dropped its ninth consecutive game to the Govs. From the outset, the Govs did not seem interested in allowing SIU Edwardsville to hang around. Over the first 11 minutes and change, the Govs built a 30-5 lead thanks largely to the efforts of Terry Taylor, who scored 11 of Austin Peay’s first 15 points, including a trio of three-pointers to put the Governors firmly in control from the opening tip. Where the Governors couldn’t miss, the polar opposite was true for the visitors: SIU Edwardsville could not buy a bucket for most of the first half. The Cougars missed 15 of their first 17 shots, and when they weren’t missing shots, they were committing turnovers (six in the first 12 minutes of play). Making matters worse, even free-throw shooting deserted them; the Cougars hit just two of their first six attempts at the charity stripe. Late in the half, SIU Edwardsville made a late run but barely made a dent in the 30-point lead the Governors had built for themselves, and Austin Peay entered halftime with a commanding 42-18 lead. 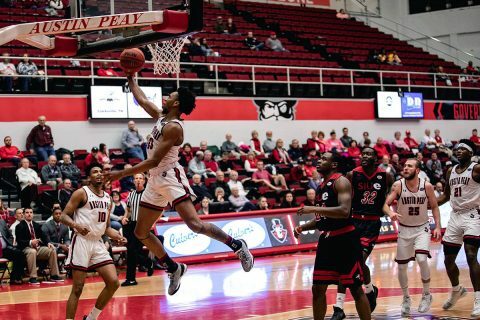 The Govs weren’t as scorched-earth hot from the field to start the second half—Austin Peay missed its first five shots—but the defense was more than capable of holding the fort until the shots began to fall. And fall they did; after the brief cold spell to start the half, the Govs hit seven of their next nine shots to force a Cougar timeout. From there, the Govs cruised. The lead never dipped below 30 points and Figger was able to rest his starters and give reserves such as Isaiah Hart (career-high 11 points) extended minutes. SIU Edwardsville missed its first six three-pointers and hit just 2-of-13 for the game. After shutting out Jacksonville State from deep and holding the Cougars without a make until deep into the second half, the Governors went 70 minutes of game action between three-pointers. That probably was not ultimately the difference in a 35-point game, but it will do. Taylor finished with 22 points on 9-of-14 from the floor, including a season-high four three-pointers. He’s now 21 points away from becoming the 36th member of the 1,000-point club at Austin Peay. Austin Peay’s ninth straight win against the Cougars is the Governors longest active streak against a league foe and longest against any OVC opponent since an 11-game streak against Jacksonville State (January 4th, 2007-January 14th, 2012). Austin Peay’s plus-10 rebounding margin was its best since Dec. 15 (plus-15 against Purdue Fort Wayne) and first positive difference since January 24th (plus-six against Tennessee State). In holding SIU Edwardsville to 45 points, it marked the first time the Govs have held a league foe below 50 points since February 9th, 2008 against then-OVC foe Samford (67-49 in the Dunn Center). 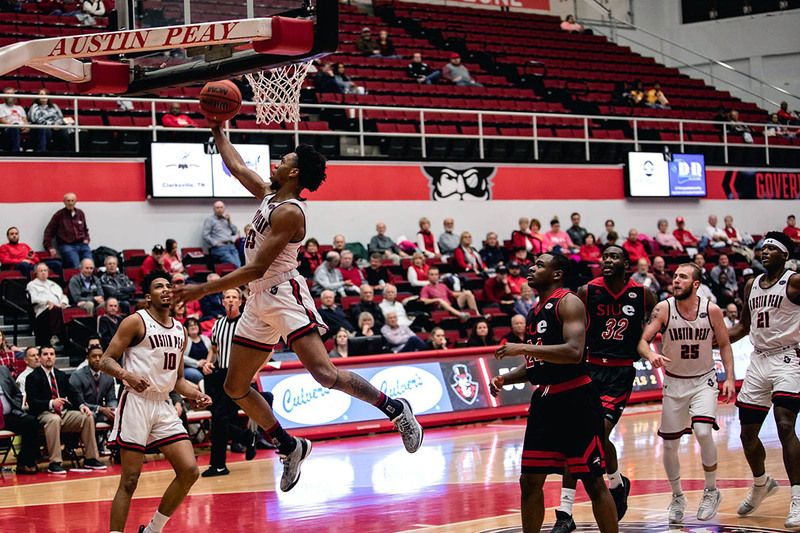 Somehow, 80 points represented the FEWEST Austin Peay has scored at home this season; the Govs are averaging 95.0 in eight home contests this season, going 7-1 in those games (best home start since 2007-08. Since the Tennessee State contest January 24th, the Govs are shooting 75.5 percent (71-of-94) from the free-throw line. Grad transfer Jabari McGhee is averaging 11.3 points on 57.7 percent (15-of-26) shooting and 5.3 rebounds the last three games. The Govs are averaging 10.5 steals over the last four games. Taylor equaled his career high with three against the Cougars. It’s also Austin Peay’s best 11-game start to the league schedule since 2007-08 (10-1). Austin Peay is at plus-50 in turnover margin over the last seven games (average: plus-7.1); the Govs have been converting on those turnovers at a high rate of late, averaging 20.7 points off turnover the last three games. The Govs remain unbeaten on Thursdays (7-0) this season; their last Thursday loss was February 15th, 2018 against Tennessee Tech (10-0 since). Now 2-0 on the season against the Cougars, Austin Peay looks to avenge an earlier loss against Eastern Illinois when the Panthers come to Clarksville for the second half of Saturday’s doubleheader; the women’s contest is scheduled for a 1:30pm tipoff, with the men to follow.